Ancient Egypt, Late Period, ca. 712 to 300 BCE. 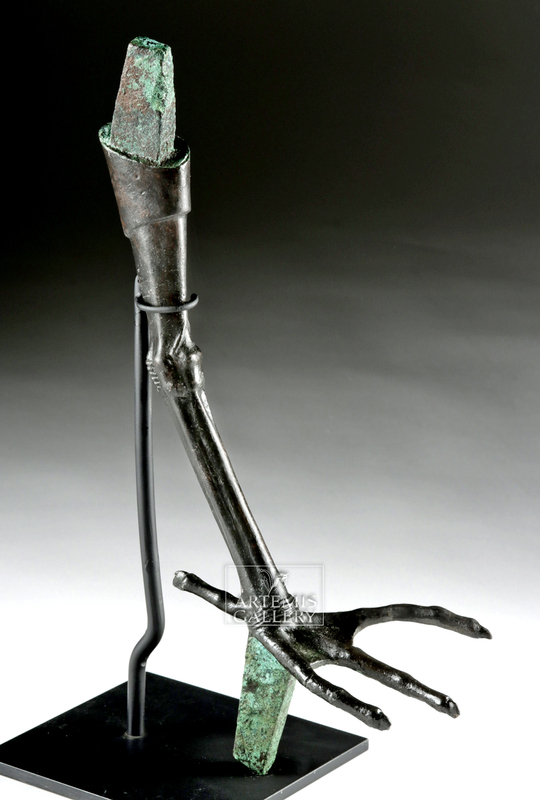 A lifesize, cast bronze leg and foot from a bronze and wood model of an ibis, with heavy tabs for inserting it into a body and plinth at top and bottom respectively. 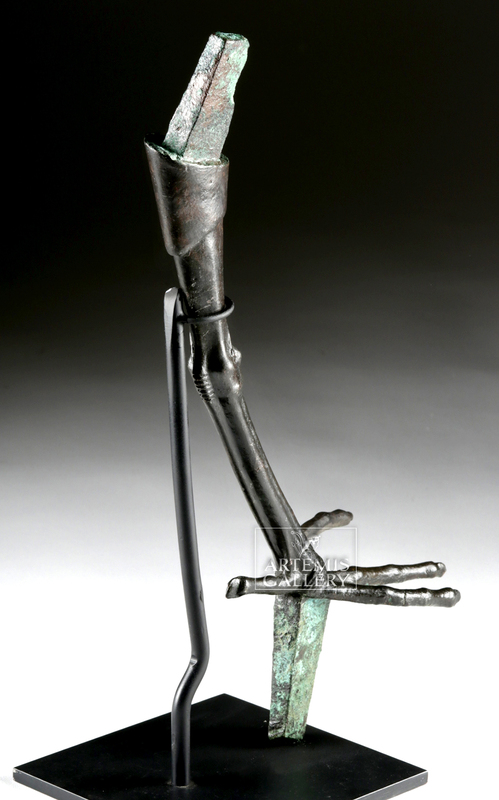 The foot is naturalistic, with clearly depicted joints, webbing between the long toes, and short claws. 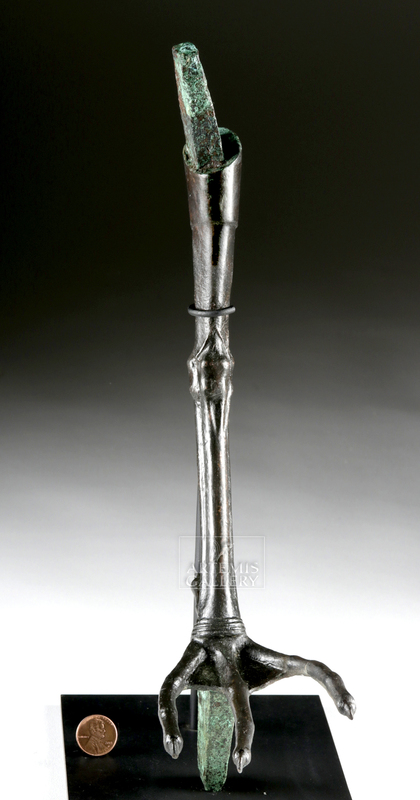 This originally would have been inserted into a wooden body, alongside a similarly-shaped, bronze other leg and foot, with a bronze head, forming a dynamic statue like the one in the link below at the Museum of Fine Arts in Houston. Size: 5.35" W x 12.95" H (13.6 cm x 32.9 cm); 13.3" H (33.8 cm) on included custom stand. The ibis, an elegant, long-legged wading bird that lives along the shores of the Nile, was associated with the god Thoth and, later, the sage Imhotep. He was the god of wisdom and writing, and in worship to him ibises were ritually sacrificed, embalmed, and mummified before being buried in underground galleries. As shocking as it may seem, there were millions of these burials, many of which have been excavated at Saqqara, near Memphis, Egypt's ancient capital. Saqqara was a temple complex with a large system of catacombs underneath it. DNA analysis on other animal mummies leads us to believe that millions of animals were bred specifically by the ancient Egyptians to be sacrificed and mummified. Especially during the Late Period, the Egyptians seem to have been obsessed with ibis (and other animal) mummies, which, in the case of ibises, were used to gain Thoth's favor. 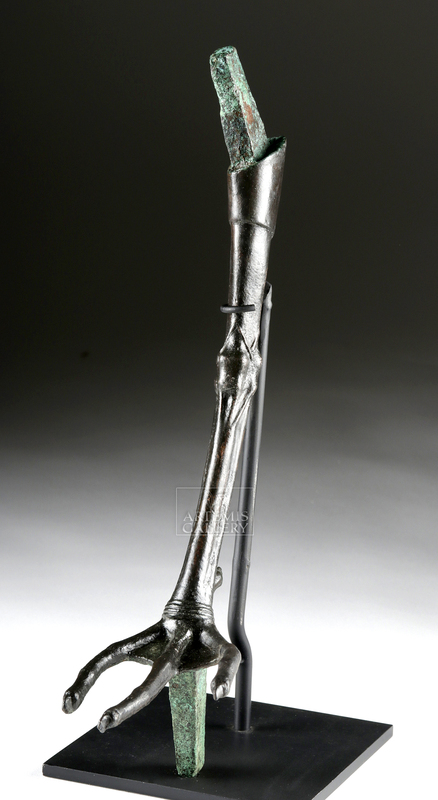 The sculpture that this leg and foot came from likely graced a temple dedicated to the god. Condition: Dark patina on surface. Nicely intact, with excellently preserved details.